At L&L Leblanc Contracting Ltd., we know every possible detail about garage door sales, installation and repair. With over 30 years’ experience, garage doors and door openers don’t hold any secrets for our team. With many fish processing plants and other industries in our area, we are experts in industrial and commercial garage door applications. Our commitment can be put in one word - quality. 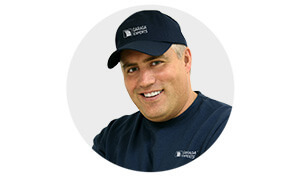 This is why we work with Garaga, the top Canadian garage door manufacturer. Their garage doors, made by Canadians and with Canadian winters in mind, offer unequalled energy efficiency plus solid construction. Visit our image gallery to see our complete collection. Do you have a garage door project in mind? Complete our online quotation form to get a price quickly. At L&L Leblanc Contracting Ltd., no job is too big or too small, so come visit our showroom. Whether for residential, commercial, industrial or agricultural applications, we can handle your project promptly and competently. Give us a call! Your door opener raises and lowers your very heavy garage door many times a day. To avoid any potential problems and ensure a well-performing opener system, it has to be built to last. At L&L Leblanc Contracting Ltd., our knowledgeable team will suggest the right opener to meet your specific needs. Because quality goes with quality, we carry the number one door opener brand: LiftMaster! Manufactured by the Chamberlain Group, safety is always put foremost. At every step in production, they use the most robust components to build their powerful motors. That results in LiftMaster being the unsurpassed door opener in its category. Visit our opener section to view our extensive line of LiftMaster products. They can be installed for commercial, residential, industrial or agricultural applications. At L&L Leblanc Contracting Ltd., we are only a phone call away from you. Our prompt and professional service is highly regarded in our local area. Our Garaga Expert certification, meaning we have passed a rigorous selection process, is more proof that we are well-qualified to properly install your garage door to meet the highest industry standards. Does your garage door need any repair? If it does, don’t wait any longer, it may lead to an emergency. With fully-stocked trucks, we can fix it in record time. We will also inspect your entire system and give you recommendations to avoid other problems. We easily can repair any other brands like Stanley, Wayne Dalton and Craftsman. To request service, feel free to give us a call at 734-422-0930. We proudly serve Southwestern Nova Scotia including Middleton, Bridgetown, Lawrencetown, Greenwood, Yarmouth, Wedgeport, Pubnico, Barrington, Shelburne Leonard and Liverpool. We look forward to serving you soon! Middleton, Bridgetown, Digby, Lawrencetown, Greenwood, Yarmouth, Wedgeport, Pubnico, Woods Harbour, Barrington, Shelburne Leonard, Liverpool.